I’ve said this before: If things seem rather quiet around here, it’s because I’m working. 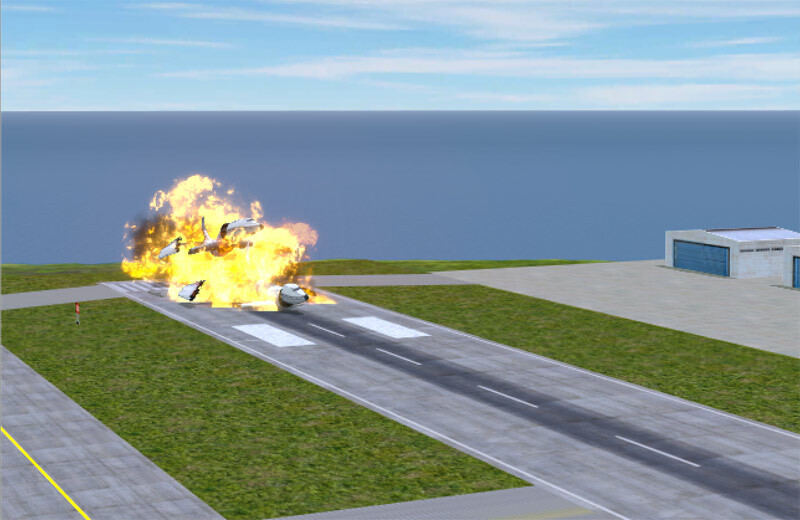 This week I intend to get some screenshots and a video teaser out to you for our upcoming Airport Madness 3D. I’m very excited about this new game development software called Unity 3D. It’s far more powerful than I need it to be, but definitely an ideal development environment for Airport Madness. As much as I want to make things look as good as possible, I’m mindful of the mobile users out there, who don’t want this game to crash on their outdated Samsung Galaxy Tab 3. So when I added realistic moving water to Airport Madness 3D, and the software asked me what type of reflection and effects I’d like, I decided to skip those and stick with something very basic. The explosion above was a very complex endeavor. I’m using very lightweight mobile-friendly aircraft models, which must break into realistic pieces during a collision. The pieces need to be highly animated, and that’s where the Unity game engine shines. Unity calculates precisely how each piece should tumble down the runway, occasionally bounce off of one another, then come to rest. The fire and smoke was my idea. After all, this is Airport Madness! It needs to be crash-errific, but hopefully not offensive to anyone. I’m really not sure when this will be ready. It’s looking like February 2016 now… fashionably late as always. I promise to deliver. I always do. Airport Madness: World Edition is doing well on all platforms, so we must make its’ bimonthly updates a priority. Even after the Release of AM3D, we intend to keep the AMWE updates coming. The next update, by the way, is December 1, 2015 and we will be adding Amsterdam, Schiphol.